Scouts are for young people, boys and girls, aged between ten and a half and fourteen years old. It is the third section in the Scouting family and an exciting way to join the Scout movement. Young people can join Scouts in the six months leading up to their tenth birthday and remain until they qualify to move to the next section, Explorer Scouts, from anytime around fourteen years old. There are loads of fun things that you can do as a Scout. You will get a chance to try lots of different activities like climbing, sailing, abseiling as well as go camping and hillwalking. Information will be provided about these extra activities as they come round. 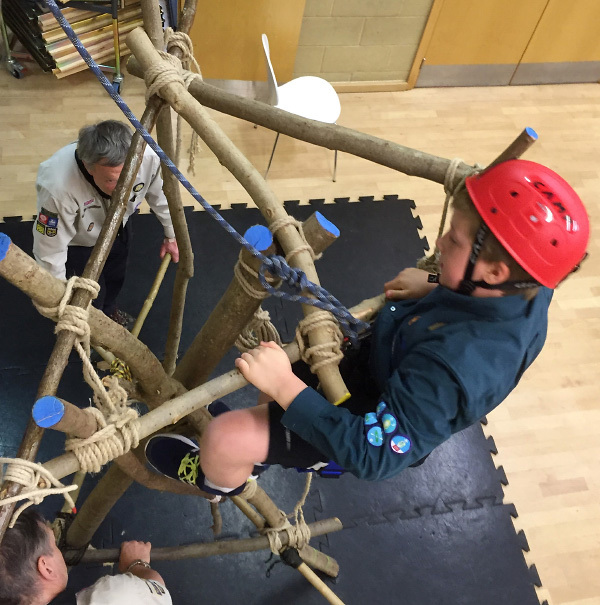 Scouts meet on a Tuesday weekly during term time from 7.00 till 9.00 p.m. The first meeting is free, thereafter subscriptions are to cover our basic running costs and insurance. This will be advised when you apply to join. There is no need for uniform in the first few weeks; we want each Scout to be sure they like attending. Our leaders are unpaid, they enjoy what they do voluntarily. We are a registered Charity. Before coming along you will need to register your interest, please do this by completing the simple form . We will add you to the waiting list and contact you with a start date. Our policy guidelines state that we should have sufficient adults to assist with our activities and refreshments. We always ask you to support our functions and always need extra adult help when we go away from the HQ. This involvement is rewarding and social. You will learn and share your child's progress and understand how to encourage them at home. The weekly programme is run by the leaders, with all adults including parent/carers DBS cleared - as you would want them to be of course. If this is something you would like to consider please contact the Group Scout Leader and he can advise various ways you can be part of The Diehards. Stay up to date and find out what Scouts of 8th St Marylebone (The Diehards) have been up to with our Scouts' blog. Join the blog and then post your own comments.